Churro Nutella Christmas Tree is a stunning 5-ingredient centrepiece for your Christmas dessert table! Churro meets the most popular Christmas dessert this year with this original Cafe Delites creation! 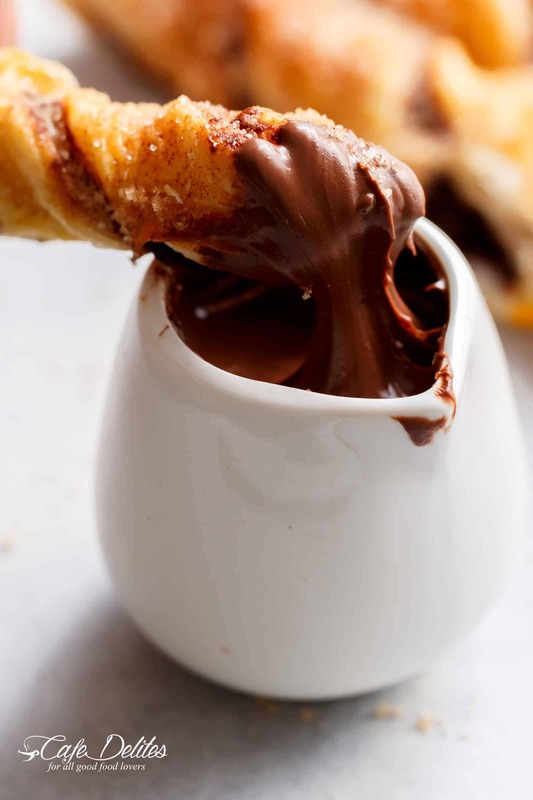 Chocolate hazelnut Nutella is baked between two sheets of puff pastry, brushed with melted butter, then sprinkled with cinnamon sugar for the BEST and closest Churro Nutella Christmas Tree without any of the effort of making your own Churro dough, or bursting any piping bags. WIN. Just like these Nutella Churro Donut Holes, this tree is gonna knock your Nutella lovin’ socks off. You may have seen these Christmas Tree’s ALL OVER THE INTERNET by now. And if you haven’t? Welcome to the most easiest pastry on planet Earth. 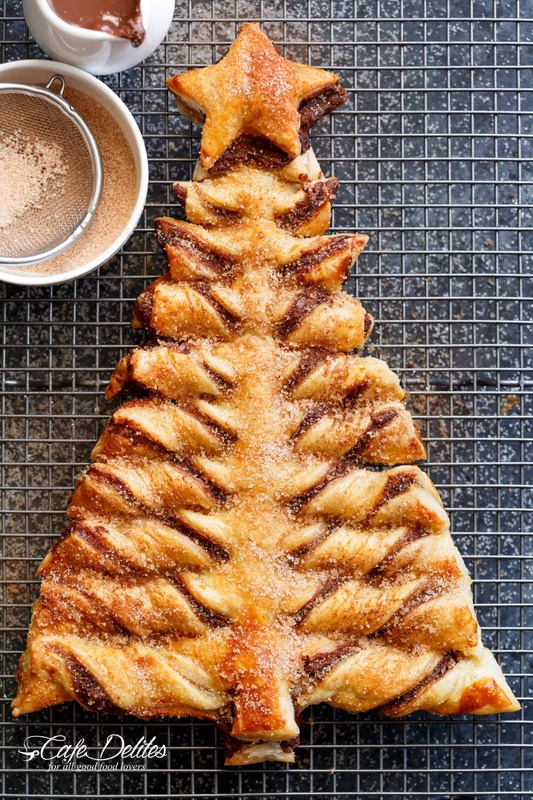 How To Make A Nutella Puff Pastry Christmas Tree? 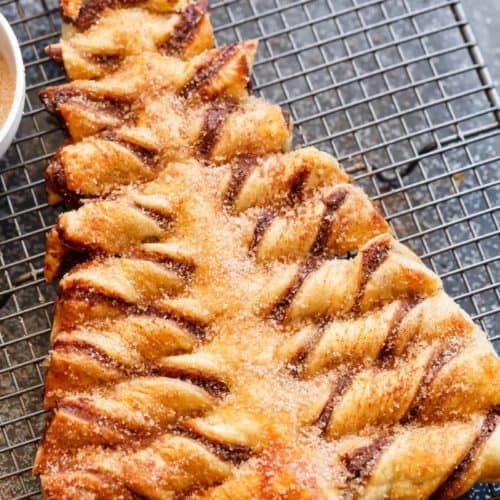 Cut out your pastry into a tree shape, careful not to cut through your parchment paper if that’s what you’re using. 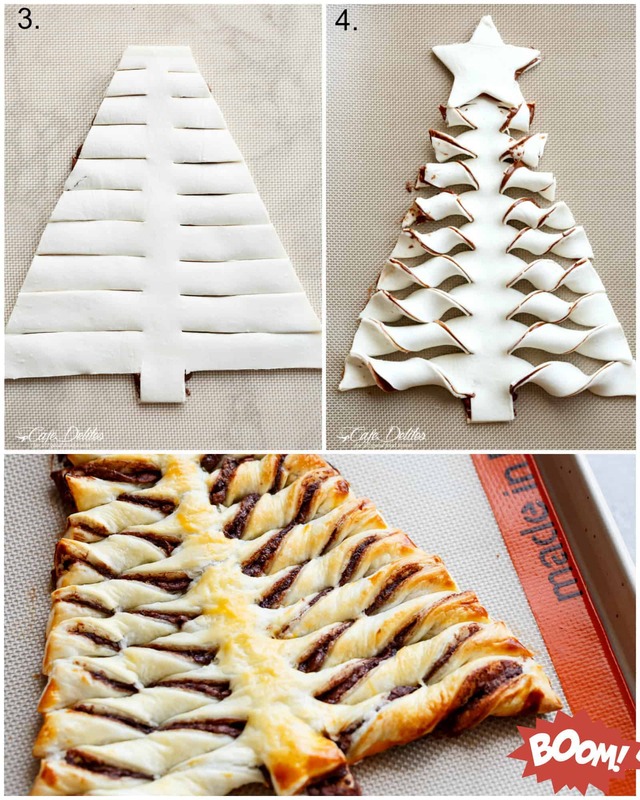 Lay 2 frozen puff pastry sheets on top of each other and cut through them to get 2 of the same tree. Don’t have them sitting on top of each other for too long though, or they will soften into each other and are extremely difficult to peel apart! The MOST crucial step in this recipe is to lay your pastry on parchment paper or a Silpat mat like the one pictured below after you’ve cut out your tree outline (before the branches are cut). Take the top pastry off and spread the bottom sheet Nutella. Ahhhhh, Nutella. The most sinful spread in the universe. If you don’t want to use store bought, you can use this homemade version instead! Through lots and lots and lots and lots and lots and lots of trial and error, (I mean, you should see the amount of trees we made, and how BAD they turned out the first TEN TIMES), I can tell you that the thicker you cut your ‘branches’, the better the end result. We preferred ours to be 1-inch wide. YES I measured. And YES OCD. By this stage, your pastry will have started to soften, making cutting so much easier. Just be patient and careful not to rip the pastry when lifting your knife out of these cuts. Twist your branches around twice if you can, and lightly press the ends into your baking sheet or mat. Make your star with a star-shaped cookie cutter, then sandwich with Nutella, because, Nutella. Place it at the top and BOOM! Christmas Tree. 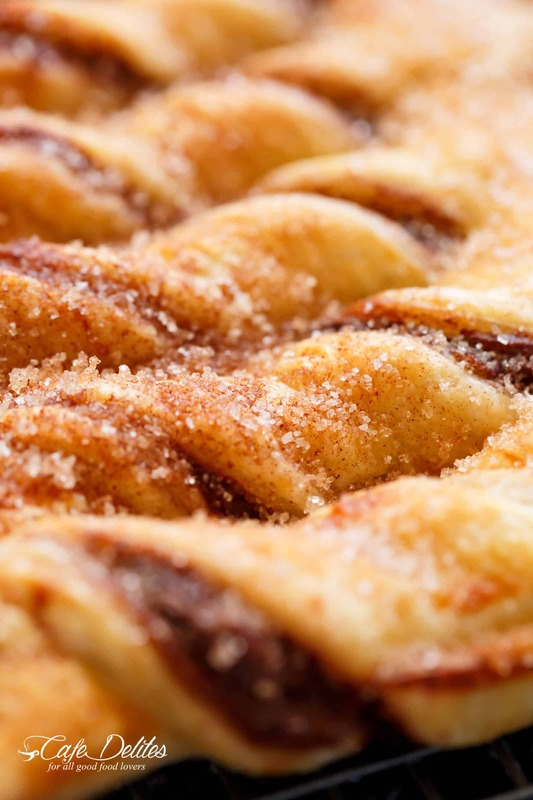 Once it’s baked and all shiny and golden, sprinkle with cinnamon sugar. WOW ’em all! Serve it with Nutella, so your friends and family can rip off those branches and dunk them right in. WATCH US MAKE THE Churro Nutella Christmas Tree RIGHT HERE! Churro Nutella Christmas Tree is a stunning 5-ingredient centrepiece for your Christmas dessert table! The BEST Churro tasting tree without any of the effort of making your own Churro dough! AN ORIGINAL CAFE DELITES CREATION! Brush pastry with egg yolk mixed with a little water. Bake for 25-30 minutes at 400°F (200°C) until golden. I love your site and your recipes! 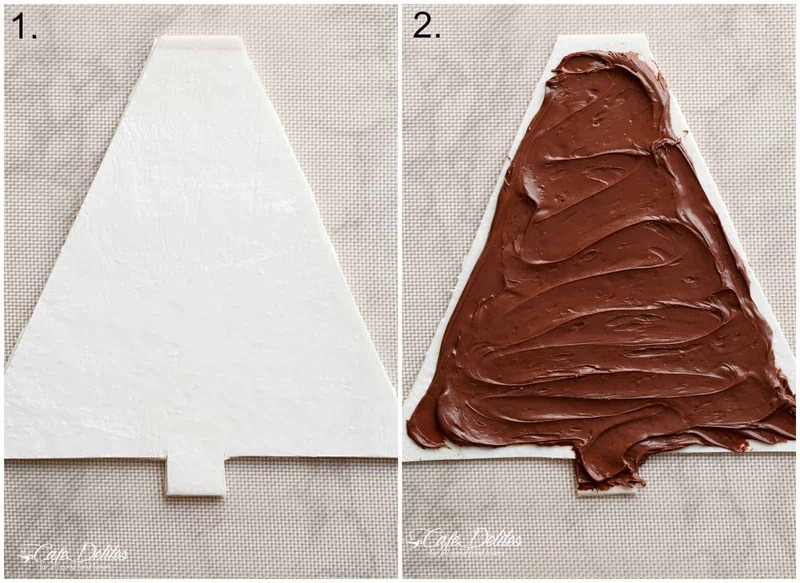 I will be making the Churro Nutella Christmas Tree for Christmas this year. This is an especially great Christmas, because my wife and I will be spending it with my daughter and son-in-law. He is a pilot in the Air Force and we are following them from base to base. Thank you again for all your recipes and ideas and have a Very Merry Christmas!!! Instead of carrying apple pie, we decided to carry this for a Christmas potluck. It was a great success and if your membership increases significantly, we’ll take the credit as we were singing your praises! Instead of carrying an apple pie (what we usually do) for a Christmas pot luck, we carried this. It was a great success! Thank you!! Hello, I wanted to make this but substitute the nutella for a different kind of chocolate spread. Something with chocolate morsels. 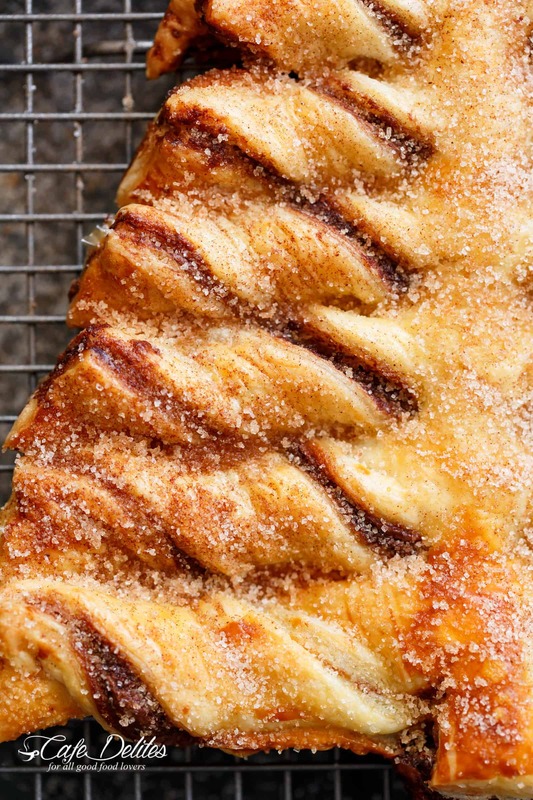 Is there anything I need to add to the morsels when melting them before I would spread the chocolate on the puff pastry? So that the filling is soft like Nutella. I have heard that you can add heavy cream or light corn syrup to melted chocolate and it will help keep is smooth and spreadable. I have not tried this so please let me know how it turns out for you. Thanks for following along. I can’t find pastry sheets that are the right size. Can I roll smaller sheets together to get the size I need? This recipe showed up in Finnish as well, and I made it from that recipe last year. The difference was that this recipe called for dates (stones removed) to be cooked for three minutes then added to the Nutella. I think it’s brilliant! I also sprinkled roughly chopped almonds inside. Oh Karina. I am so excited to try this – it looks beautiful, and with ingredients like these, how can it not taste beautiful!? Hey, I have someone who is allergic to cinnamon, can I leave it out or is churros usually made with it? So easy and delicious! Not to mention beautiful! Thank you ! What size pastry sheets do you use and what brand? I use Coles brand in Australia. They are 30cm x 30cm sheets (12″x12″). We just finished this and everyone demanded we make 2 more! You know it’s good when people want more. I swear you make me look like a chef. Fantastic recipe Karina thank you! Can this be prepped the. Ignite before and refrigerated? Hi Marsha. Yes it can! Bake and decorate the day of serving. You could also bake it the day before, cover with plastic wrap and keep refrigerated. Then warm it up in the oven the day of serving and decorate it. Could you use a friut spread instead? My family doesnt like nutella. This looks fantastic; I know what I’m taking to the Christmas Party tomorrow, thank you! Is this gluten free by any chance? I think you just saved me Katrina! Christmas might be more fun than stressful! Yay! Thank you so much for all this hope! Thanks for the tree! it looks fantastical! Michael it’s on my list for next year! Great minds think alike haha!